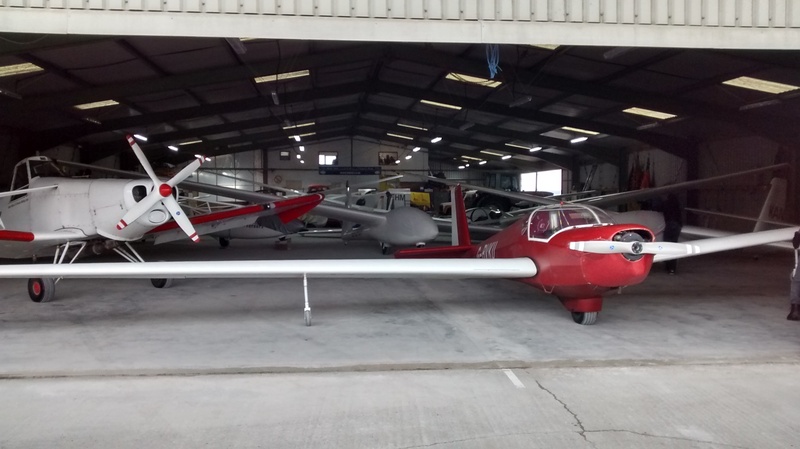 In a cold north easterly, instructors took turns to fly the ASK21 on loan from Tim D, firstly from the back seat as PUI, then from the front as PIC with the next one in the back. That kept up the concentration of our dedicated log-keepers too! Alastair and Mark H. took a tow to spin it. Thanks to Mark P. for getting the Pawnee back on line. 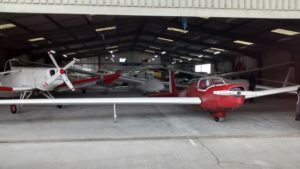 Ahead of another lovely meal from Julie & John ( mmm, luscious sauce ) and the Presentation & Safety Meeting, this is how we stacked the hangar with three single seaters, four twin seats, the Pawnee and the Venture ( plenty of room, even if it had a spinner in place). More than one way to skin a cat ( oops, sorry pussycat lovers) ……. If anyone spotted my dark green hat, with LEDs in its peak, lurking lonely today, please let me know. I’ll look around for it on Saturday. A grey day but a light wind, so our brand new solo pilots, Damien and Andy, were able to consolidate with more solo flying. Congratulations to both! A few old hands flew too and Harriet kept us all in order. We did ten winch launches and the Venture few three times. Just after we finished, four youngish local gents turned up to watch but we hope they will return as potential members. Damien recognised one of them and had a chat, so that’s a helpful start and a good finish to the day. Mick was on site early again, to get contractors digging a channel outside the south side of the hangar. This will house new electrical cables and water drainage pipework. They will continue work tomorrow. Unfortunately, the other team of contractors did not arrive to cut the expansion slots in the southside hangar floor. Hopefully, they will turn up to complete the job tomorrow.